Army of Darkness is the third movie in the Evil Dead series, starring Bruce Campbell. If you are a fan of fantasy/science fiction and slap stick comedy, Army of Darkness is the right choice for you. Full of corny humor, Army of Darkness tells the story of Ash Williams, a 20th century man who, after losing his hand to an evil force, is forced by that evil into a time portal and transported back to medieval times. Ash finds himself, and his car, surrounded by horses, castles, kings and brave and not so brave, Knights. After falling into this new era, the local wise man decides that Ash is the man that has been foretold to deliver the kingdom from their very own evil. Trying to force the locals to help him find his way back home, Ash agrees to help them retrieve a magic book from an ancient cemetery. After cutting corners and bungling the retrieval, Ash unleashes an army of undead bent on recovering the book for themselves. Decent special effects and good acting leads this comedy down an entertaining path of 14th century sword fighting with a touch of 20th century artistry. Ash's heroine is Sheila, played by Embeth Davidtz. Sheila faces her own challenges as the undead make her their undead queen. Ash then finds himself having to battle the woman he was once trying to protect. 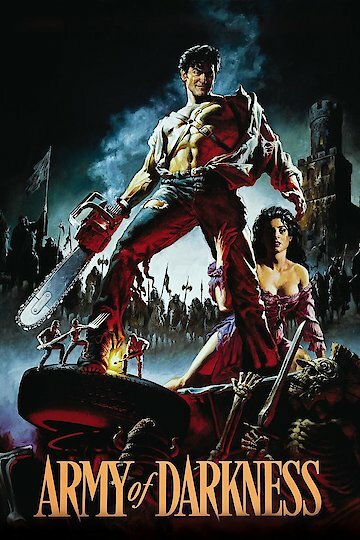 While this movie is indeed the third of three movies featuring Ash Williams and the undead, it does stand alone and nothing is missed if you haven't seen the first two. Bruce Campbell's Ash Williams has developed a slight cult following. This following has resulted in several comic books being written about Ash and the deadites, and a few video games based on the series of movies as well. Join the cheesy humor movie experience and check out Army of Darkness. Army of Darkness is currently available to watch and stream, download, buy on demand at Shudder, Amazon, Vudu, Google Play, iTunes, YouTube VOD online.